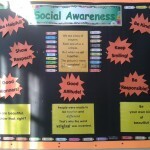 Year 1 – How are we working to achieve our goal of Social Awareness? How are we working to achieve our goal of Social Awareness? In the first year of the children in this school, they primarily need to learn how to work and play with one another. They need to learn how to interact in the right way, be it with adults or children. 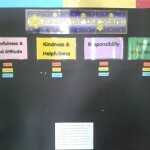 We have had various discussions and read stories pertaining to this concept and ultimately set up our targets board. In the close future we will be engaging in more practical activities to promote this concept. Some of these activities include visiting the Poor Clares at Christmas time to entertain them with our singing and will also be asking the children to bring a small toiletry gift for them. We have been filling our piggy banks with coins for the people in need people and the children have been asked to do something to earn this money and not to simply ask for money. Soon we will be having our very own Christmas fair in which all proceeds go to various charities. Christmas time is indeed a time of giving and it is never too early to start educating our children on this concept. Our Christmas play has a strong focus on the theme of Social Awareness and we hope that whilst enjoying themselves in the preparation of this production, they will also absorb the message that we are trying to give. Moving back to our Social Awareness targets, we will be giving out 4 certificates per class every month to the children that we feel have worked hard to achieve these targets. We believe that children should feel proud when they receive their certificate and we have set up another board to record these achievements. We look forward to a fun filled year ahead and remember that we believe that education is not based simply on the intellect but we believe in a holistic approach.